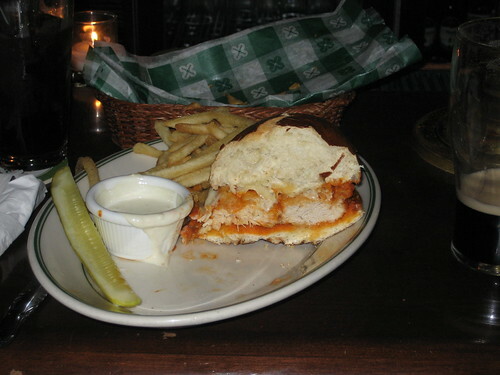 This is the Buffalo Chicken sandwich from Grace O’Malley’s in the South Loop. It has a lightly breaded chicken breast doused in buffalo sauce with pepperjack cheese and comes with blue cheese on the side (along with lettuce, tomatoe, onions, fries, and a pickle). I can’t recall exactly, but I think it was $8.95. I felt like I was stealing because it was so damn good. Grace O’Malley’s version of the buffalo chicken is probably one of the best I’ve had. Let’s start with the wing sauce. I would rank the heat at a solid medium, which is weaker than I usually like it, but you don’t have any choice. You can tell that they actually dunk it in a vat of wing sauce and roll it around for a little, they don’t just squirt some sauce on it like your low-class joints do. Notice the perfect lower bun saturation, a hallmark of a great sauced sandwich; about a 35% saturation, enough to heighten the flavor yet not make it a soggy mess. Now the bun, that is something special. Check out the depth on the top half! It’s a pretzel style roll, which they also use on the burger, and it is incredible. The surface is kind of crispy but the inside is all white, fluffy, and tasty and it springs back shortly to its original shape after each bite. One more item of note, check out the empty wicker serving basket in the background. That was the previous holder of the Grace O’Malley’s potato chips. I gotta believe they are homemade. They are thick and have a spicy something on them, can’t tell if it is barbecue or what. One member of my group detected some paprika. Suffice it to say, I can’t blow any holes in this dining experience. Move it up the list. Posted in food on 2006/12/30 by John.